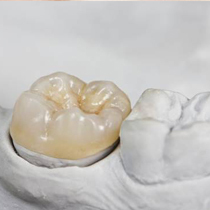 Dental crowns can be made from one of several materials, including natural-looking porcelain, metal alloys, and gold. The option that is right for your smile depends on your oral health needs, your budget, and other factors. Porcelain is best for a tooth in the front of the smile, while molars and premolars may be better served by sturdy gold. We will discuss all of your options during an initial consultation. A dental bridge is a restoration that fills the gap left by one, two, or several consecutively missing teeth. Two crowns are placed over the teeth surrounding the empty space and replacement teeth (known as “pontics”) fill in the gap between. A bridge is a sturdy restoration that gives patients back the ability to eat, speak, and smile with confidence — and it also prevents the surrounding teeth from drifting out of place. What Is the Process for Crowns and Bridges? It generally takes two visits to place a dental crown or bridge. During the first appointment, we will prepare and take impressions of the tooth/teeth that will receive the crown(s). A temporary restoration will be placed on top of the prepared tooth and we will send the specifications of your crown or bridge to our partner lab. Once the restoration has arrived back at our office, you return for its final placement. With proper maintenance, your dental crown or bridge should last for many years. We will instruct you to brush and floss your teeth regularly, concentrating on the area at the base of the restoration to prevent plaque and bacteria buildup. Notify your dentist as soon as possible if you start to notice an issue with your crown or bridge — like if it is loose, uncomfortable, or otherwise problematic.